A recent national survey of 2,000 adults conducted by the non-partisan American Culture and Faith Institute reveals that the more committed to biblical Christianity a person is the more likely they are to be distinguished from those who are less committed to the Christian faith, from those who favor a non-Christian faith, and from people who have no faith at all. The survey’s director, George Barna, also noted that the more deeply people study and trust the Bible, the more likely they are to favor capitalism over socialism. However, among people under the age of 35, socialism is rapidly emerging as the economic system of choice whether they are Christian or not. Across the nation, four out of ten adults (41%) say they prefer socialism to capitalism. The survey discovered that for many people, that is a knee-jerk reaction: they do not really understand what socialism is, and their views on more than three dozen aspects of economics and government suggest that they would actually prefer capitalism if they understood both it and socialism more completely. In fact, after responding to many questions about the workings of economics and governance, the public switched from 41% saying they preferred socialism to capitalism to just 25% opting for a socialist system in America. The research also indicated that Americans have thought neither extensively nor intensively about the nation’s economic system and alternative systems. However, two-thirds (65%) believe the United States currently is a predominantly capitalist society. Interestingly, a large share of Americans is not sure what will happen to the nation in the future: only 40% believe the U.S. will remain a capitalist nation. However, that is double the proportion (21%) who foresees the U.S. turning socialist. The remaining one-third of the populace either foresees a shift to some other economic approach or has no idea where we are headed. However, the more likely a respondent was to believe that the Bible teaches truth, to say that it is an accurate and reliable source of wisdom, and to spend time reading the Bible during a typical week, they more likely they were to argue that capitalism best fits a biblical lifestyle. 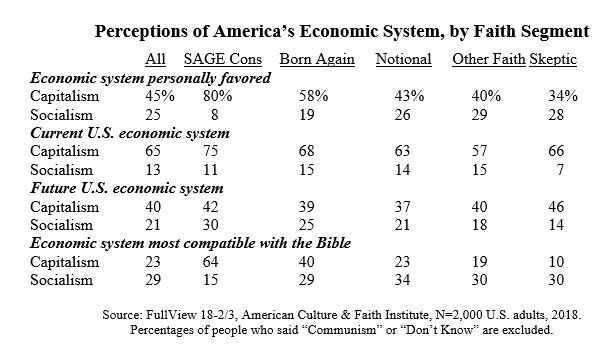 Overall, two-thirds (64%) of SAGE Cons – the spiritually active, governance engaged conservative Christians – said the Bible is most compatible with capitalism. That dropped to just 40% among all born again Christians and only 25% of Notional Christians. Even smaller proportions of non-Christians – 18% of people associated with a non-Christian faith and 12% of Skeptics – believed the Bible is more compatible with capitalism. In contrast, the people least familiar with and engaged with the Bible were more likely to say that it is more compatible with socialism than capitalism. While just 16% of SAGE Cons and 28% of all born again Christians drew that conclusion, pluralities of Notional Christians (33%), people associated with non-Christian faiths (29%) and Skeptics (28%) leaned toward socialism. Significant, though, was the number of people from each group who admitted that they had no idea which economic system is most compatible with the Bible, ranging from 19% of SAGE Cons to 28% of born agains, and jumping to 36% of Notionals, 41% of those aligned with non-Christian faiths, and a majority of Skeptics (53%). Protestants and Catholics also differed on this matter. Among Protestants 40% said the Bible is most compatible with capitalism while 28% chose socialism. In contrast, Catholics were more likely to say the Bible is most compatible with socialism (35%) than with capitalism (27%). The ACFI survey found that there are areas where Americans agree about government, regardless of their faith views, and other aspects of government that differ in support in relation to faith perspectives. Importantly, Americans agreed on 70% of the governance-related questions posed to the respondents. There were also a handful of views that appealed to all but one of the faith-related groups studied – those who associate with a non-Christian faith, such as Judaism, Buddhism, or others outside of the Christian community. SAGE Cons, born again Christians, Notional Christians, Protestants, Catholics, and Skeptics agreed that society is better off when the government is comprised of servant-leaders whose job is to discern and carry out the will of the people. In contrast, people who associate with a non-Christian faith were more likely to believe that America would be better off with a government of experts who have good intentions and substantial power to make decisions on behalf of the public. A majority of adults aligned with a non-Christian faith (53%) believes that extensive government regulations are necessary to protect and advance the public interest. Half of Catholics embrace that view. A minority of all of the other Christian segments, as well as just four out of ten Skeptics, bought into that notion. There was a pair of statements regarding which SAGE Cons were the lone voice in the wilderness. They, alone, dismissed the idea that the U.S. Constitution is a living document that should be interpreted in relation to current knowledge, needs, and conditions rather than in its original context. They were also the only faith-related segment from which a minority endorsed the notion that rich people pay their fair share of taxes for government services. In fact, SAGE Cons emerged as a unique voice regarding government. The ideology of the segment was communicated loud and clear: government is more of a problem than a solution. More than any other faith-driven segment, SAGE Cons believe that government has too much power and exerts too much control over people’s lives, and that the nation would be in better shape if the economy were more market-driven and less regulated. They believe in serving the poor and helpless, but not through government intervention. According to election research conducted by ACFI throughout the 2016 presidential campaign, SAGE Cons were instrumental in voting Donald Trump into the White House, despite their misgivings about his character. (For more information about SAGE Cons and the election, read The Day Christians Changed America, by George Barna.) Since his inauguration, SAGE Cons have also been the faith-related segment most likely to approve of Mr. Trump’s job performance. Catholics are more likely to view government as a friend of the people that should be empowered to impose economic equality and regulatory controls upon the public. They are more likely to see positive possibilities through extensive government intervention in peoples’ lives. Protestants are more likely to believe in the free market and in the will and abilities of the people, opting to place greater restraints on government interventions of all types. They are more likely to see government as inefficient, self-serving, and unreliable. The results of the survey show how little people have thought about economic systems. According to George Barna, there is danger in giving credence to superficial statements about personal preferences. “In a fast-paced, sound-bite society like ours the tendency is to accept peoples’ snap judgments and top-of-mind statements as serious opinions. But when we give people some time to reflect on what they really believe, the outcomes are often different than the simplistic, socially desirable catchphrases that make for good headlines,” commented George Barna, director of ACFI’s survey. The research described in this report is drawn from FullView™, a monthly nationwide survey with a randomly-selected sample of adults, age 18 or older, whose demographic profile reflects that of the adult population. This analysis is based on an online survey conducted among 2,000 adults between January 26 – February 4, 2018. Born again Christians are people who consider themselves as Christian and believe that when they die they will go to Heaven only because they have confessed their sins and accepted Jesus Christ as their Savior. Being born again is NOT based on describing oneself as “born again” and it is not based on church attendance. Born again Christians are about 30% of the adult population. Other Faithis a category that includes anyone who is aligned with a faith community that is not Christian in nature. These 9% of U.S. adults include those who are associated with faiths such as Buddhism, Judaism, Islam, Scientology, Hinduism, and the like. SAGE Consare a hybrid segment that combines faith and politics. The name stands for SpirituallyActive Governance Engaged Conservative Christians. They are defined as adults who are registered to vote; they vote regularly and at higher turnout rates than the norm; they consistently pay attention to news about government and politics; consider themselves to be Christian; are born again (see above definition); are deeply committed to pursuing their Christian faith; are conservative on social and economic issues; and are theologically conservative. They represent between 8% and 10% of the national adult population, constituting some 20-25 million voting-aged individuals. The American Culture & Faith Institute is a division of United in Purpose, a non-partisan, non-profit organization. The mission of United in Purpose is to educate, motivate and activate conservative Christians to engage in cultural transformation in ways that are consistent with biblical principles. The organization does not support or promote individual political candidates or parties. For access to many other studies conducted by ACFI, please visit the company website (www.culturefaith.com). To receive a free copy of the research reports produced by ACFI, visit the website and register for the American Culture Review newsletter.